Following is the final excerpt from my new book, “Incredible Stories From Space: A Behind-the-Scenes Look at the Missions Changing Our View of the Cosmos.” The book is an inside look at several current NASA robotic missions, and this excerpt is part 3 of 3 posted here on Universe Today, of Chapter 2, “Roving Mars with Curiosity.” You can read Part 1 here, and Part 2 here. The book is available in print or e-book (Kindle or Nook) Amazon and Barnes & Noble. How does Curiosity know where and how to drive across Mars’ surface? You might envision engineers at JPL using joysticks, similar to those used for remote control toys or video games. But unlike RC driving or gaming, the Mars rover drivers don’t have immediate visual inputs or a video screen to see where the rover is going. And just like at the landing, there is always a time delay of when a command is sent to the rover and when it is received on Mars. “It’s not driving in a real-time interactive sense because of the time lag,” explained John Michael Morookian, who leads the team of rover drivers. The actual job title of Morookian and his team are ‘Rover Planners,’ which precisely describes what they do. Instead of ‘driving’ the rovers per se; they plan out the route in advance, program specialized software, and upload the instructions to Curiosity. Using all available data, they can create a three-dimensional visualization of the terrain with specialized software called the Rover Sequencing and Visualization Program (RSVP). “This is basically a Mars simulator and we put a simulated Curiosity in a panorama of the scene to visualize how the rover could traverse on its path,” Morookian explained. “We can also put on stereo glasses, which allow our eyes to see the scene in three dimensions as if we were there with the rover. In virtual reality, the rover drivers can manipulate the scene and the rover to test every possibility of which routes are the best and what areas to avoid. There, they can make all the mistakes (get stuck in a dune, tip the rover, crash into a big rock, drive off a precipice) and perfect the driving sequence while the real rover remains safe on Mars. When Curiosity’s Navigation Cameras (Navcams) take black-and-white images and send them back to Earth each day, rover planners combine them with other rover data to create 3D terrain models. 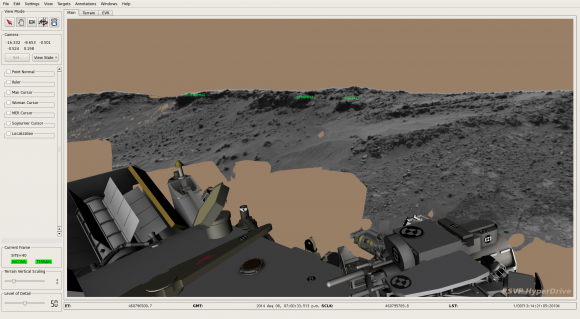 By adding a computerized 3D rover model to the terrain model, rover planners can understand better the rover’s position, as well as distances to, and scale of, features in the landscape. Credit: NASA/JPL-Caltech. So, every night the rover is commanded to shut down for eight hours to recharge its batteries with the nuclear generator. But first Curiosity sends data to Earth, including pictures of the terrain and any science information. On Earth, the Rover Planners take that data, do their planning work, complete the software programing and beam the information back to Mars. Then Curiosity wakes up, downloads the instructions and sets to work. And the cycle repeats. Curiosity also has an AutoNav feature which allows the rover to traverse areas the team hasn’t seen yet in images. So, it could go over the hill and down the other side to uncharted territory, with the AutoNav sensing potential hazards. A view of the Space Flight Operations Facility at the Jet Propulsion Laboratory, where all the data going both to and from all planetary missions is sent and received via the Deep Space Network. Credit: Nancy Atkinson. As Morookian showed me the various rooms used by rover planning teams at JPL, he explained how they need to operate over a number of different timescales. Another process called Supra-Tactical looks out to just the next week. This involves science planners managing and refining the types of activities the rover will be doing in the short term. Also, since no one on the team lives on Mars Time anymore, on Fridays the Rover Planners work out the plans for several days. The data that comes down from the rover over the weekend is monitored, however, and if there is a problem, a team is called in to do a more detailed assessment. Morookian indicated they’ve had to engage the emergency weekend team several times, but so far there have been no serious problems. “It does keep us on our toes, however,” he said. The rover features a number of reactive safety checks on the amount of overall tilt of the rover deck and the articulation of the suspension system of the wheels, so if the rover is going over an object that is too large, it will automatically stop. Curiosity wasn’t built for speed. It was designed to travel up to 660 feet (200 meters) in a day, but it rarely travels that far in a Sol. By early 2016 the rover had driven a total of about 7.5 miles (12 km) across Mars’ surface. This image shows a close-up of track marks left by the Curiosity rover. Holes in the rover’s wheels, seen here in this view, leave imprints in the tracks that can be used to help the rover drive more accurately. The imprint is Morse code for ‘JPL,’ and aids in tracking how far the rover has traveled. Credit: NASA/JPL-Caltech. There are several ways to determine how far Curiosity has traveled, but the most accurate measurement is called ‘Visual Odometry.’ Curiosity has specialized holes in its wheels in the shape of Morse code letters, spelling out ‘JPL’ – a nod to the home of the rover’s science and engineering teams – across the Martian soil. Careful inspection of the rover tracks can reveal the type of traction the wheels have and if they have slipped, for instance due to high slopes or sandy ground. Unfortunately, Curiosity now has new holes in its wheels that aren’t supposed to be there. Morookian and Project Scientist Ashwin Vasavada both expressed relief and satisfaction that overall — this far into the mission — Curiosity is a fairly healthy rover. The entire science payload is currently operating at nearly full capability. But the engineering team keeps an eye on a few issues. “Around sol 400, we realized the wheels were wearing faster than we expected,” Vasavada said. The team operating the Curiosity Mars rover uses the Mars Hand Lens Imager (MAHLI) camera on the rover’s arm to check the condition of the wheels at routine intervals. 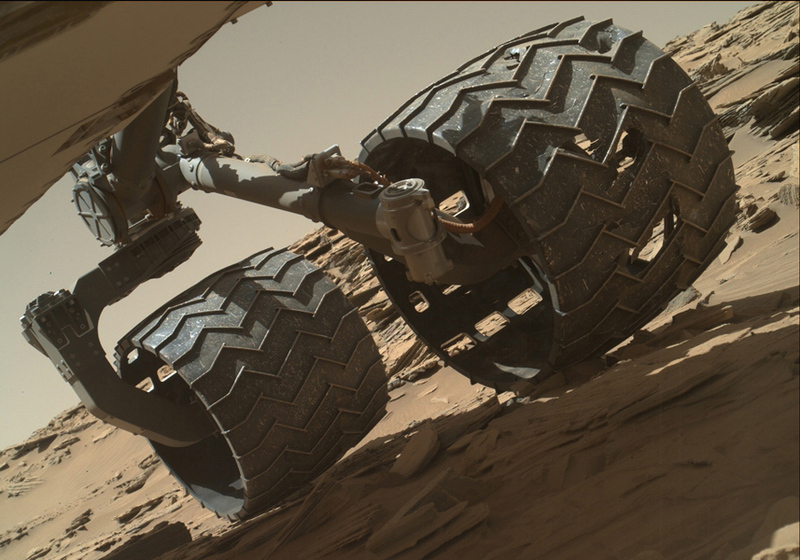 This image of Curiosity’s left-middle and left-rear wheels is part of an inspection set taken on April 18, 2016, during the 1,315th sol of the rover’s work on Mars. Credit: NASA/JPL-Caltech/MSSS. And the wear didn’t consist of just little holes; the team started to see punctures and nasty tears. Engineers realized the holes were being created by the hard, jagged rocks the rover was driving over during that time. Early in the mission, Curiosity’s computer went into ‘safe mode’ several times, as Curiosity’s software recognized a problem, and the response was to disallow further activity and phone home. Specialized fault protection software runs throughout the modules and instruments, and when a problem occurs, the rover stops and sends data called ‘event records’ to Earth. The records include various categories of urgency, and in early 2015, the rover sent a message that essentially said, “This is very, very bad.” The drill on the rover’s arm had experienced a fluctuation in an electrical current – like a short circuit. Since the team can’t go to Mars and repair a problem, everything is fixed either by sending software updates to the rover or by changing operational procedures. Curiosity’s drill in the turret of tools at the end of the robotic arm positioned in contact with the rock surface for the first drilling of the mission on the 170th sol of Curiosity’s work on Mars (Jan. 27, 2013) in Yellowknife Bay. The picture was taken by the front Hazard-Avoidance Camera (Hazcam). Image credit: NASA/JPL-Caltech. A lighter touch on the drill also was necessary for the softer mudstones and sandstones the rover encountered. Morookian said there was concern the layered rocks might not hold up under the assault of the standard drilling protocol, and so they adjusted the technique to use the lowest ‘settings’ that still allows the drill to make sufficient progress into the rock. But opportunities to use the drill are increasing as Curiosity begins its traverse up the mountain. The rover is traveling through what Vasavada calls a “target rich, very interesting area,” as the science team works to tie together the geological context of everything they are seeing in the images. While the diversion at Yellowknife Bay allowed the team to make some major discoveries, they felt pressure to get to Mt. Sharp, so “drove like hell for a year,” Vasavada said. Now on the mountain, there is still the pressure to make the most of the mission, with the goal of making it through at least four different rock units – or layers — on Mt. Sharp. Each layer could be like a chapter in the book of Mars’ history. Vasavada and Morookian both said it’s a challenge to preserve that balance every day — to find what’s called the ‘knee in the curve’ or ‘sweet spot’ of the perfect optimization between driving and stopping for science. Then there’s the balance between stopping to do a full observation with all the instruments and doing ‘flyby science’ where less intense observations are made. Curiosity’s primary target is not the summit, but instead a region about 1,330 feet (400 meters) up where geologists expect to find the boundary between rocks that saw a lot of water in their history, and those that didn’t. That boundary will provide insight into Mars’ transition from a wet planet to dry, filling in a key gap in the understanding of the planet’s history. he Curiosity rover recorded this view of the Sun setting at the close of the mission’s 956th sol (April 15, 2015), from the rover’s location in Gale Crater. This was the first sunset observed in color by Curiosity. The image comes from the left-eye camera of the rover’s Mast Camera (Mastcam). Credit: NASA/JPL-Caltech/MSSS/Texas A&M University. No one really knows how long Curiosity will last, or if it will surprise everyone like its predecessors Spirit and Opportunity. Having made it past the ‘prime mission’ of one year on Mars (two Earth years), and now in the extended mission, the one big variable is the RTG power source. While the available power will start to steadily decrease, both Vasavada and Morookian don’t expect that to be in an issue for at least four more Earth years, and with the right “nurturing,” power could last for a dozen years or more. But they also know there’s no way to predict how long Curiosity will go, or what unexpected event might end the mission. Does Curiosity have a personality like the previous Mars rovers? “Actually no, we don’t seem to anthropomorphize this rover like people did with Spirit and Opportunity,” Vasavada said. “We haven’t bonded emotionally with it. Sociologists have actually been studying this.” He shook his head with an amused smile. Vasavada indicated it might have something to do with Curiosity’s size. Curiosity appears to be photobombing Mount Sharp in this selfie image, a mosaic created from several MAHLI images. Credit: NASA/JPL-Caltech/MSSS/Edited by Jason Major. What has come to come to characterize this mission, Vasavada said, is the complexity of it, in every dimension: the human component of getting 500 people to work and cooperate together while optimizing everyone’s talents; keeping the rover safe and healthy; and keeping ten instruments going every day, which are sometimes doing completely unrelated science tasks. “Incredible Stories From Space: A Behind-the-Scenes Look at the Missions Changing Our View of the Cosmos” is published by Page Street Publishing, a subsidiary of Macmillan. Author Nancy Atkinson at JPL with a model of the Curiosity Rover. We may be living in the Golden Age of Mars Exploration. With multiple orbiters around Mars and two functioning rovers on the surface of the red planet, our knowledge of Mars is growing at an unprecedented rate. But it hasn’t always been this way. Getting a lander to Mars and safely onto the surface is a difficult challenge, and many landers sent to Mars have failed. The joint ESA/Roscosmos Mars Express mission, and its Chiaparelli lander, is due at Mars in only 15 days. Now’s a good time to look at the challenges in getting a lander to Mars, and also to look back at the many failed attempts. For now, NASA has the bragging rights as the only organization to successfully land probes on Mars. And they’ve done it several times. But they weren’t the first ones to try. The Soviet Union tried first. The USSR sent several probes to Mars starting back in the 1960s. They made their first attempt in 1962, but that mission failed to launch. That failure illustrates the first challenge in getting a craft to land on Mars: rocketry. We’re a lot better at rocketry than we were back in the 1960’s, but mishaps still happen. Then in 1971, the Soviets sent a pair of probes to Mars called Mars 2 and Mars 3. They were both orbiters with detachable landers destined for the Martian surface. The fate of Mars 2 and Mars 3 provides other illustrative examples of the challenges in getting to Mars. Mars 2 separated from its orbiter successfully, but crashed into the surface and was destroyed. The crash was likely caused by its angle of descent, which was too steep. This interrupted the descent sequence, which meant the parachute failed to deploy. So Mars 2 has the dubious distinction of being the first man-made object to reach Mars. Mars 3 was exactly the same as Mars 2. The Soviets liked to do missions in pairs back then, for redundancy. Mars 3 separated from its orbiter and headed for the Martian surface, and through a combination of aerodynamic breaking, rockets, and parachutes, it became the first craft to make a soft landing on Mars. So it was a success, sort of. But after only 14.5 seconds of data transmission, it went quiet and was never heard from again. The cause was likely an intense dust storm. In an odd turn of events, NASA’s Mariner 9 orbiter reached Mars only days before Mars 2 and 3, becoming the first spacecraft to orbit another planet. It captured images of the planet-concealing dust storms, above which only the volcanic Olympus Mons could be seen. These images provided an explanation for the failure of Mars 3. In 1973, the Soviets tried again. They sent four craft to Mars, two of which were landers, named Mars 6 and Mars 7. Mars 6 failed on impact, but Mars 7’s fate was perhaps a little more tragic. It missed Mars completely, by about 1300 km, and is in a helicentric orbit to this day. In our day and age, we just assume that our spacecraft will go where we want them to, but Mars 7 shows us that it can all go wrong. After all, Mars is a moving target. In the 1970s, NASA was fresh off the success of their Apollo Program, and were setting their sites on Mars. They developed the Viking program which saw 2 landers, Viking 1 and Viking 2, sent to Mars. Both of them were probe/lander configurations, and both landers landed successfully on the surface of Mars. The Vikings sent back beautiful pictures of Mars that caused excitement around the world. In 1997, NASA’s Martian Pathfinder made it to Mars and landed successfully. Pathfinder itself was stationary, but it brought a little rover called Sojourner with it. Sojourner explored the immediate landing area around Pathfinder. Sojourner became the first rover to operate on another planet. Pathfinder was able to send back over 16,000 images of Mars, along with its scientific data. It was also a proof of concept mission for technologies such as automated obstacle avoidance and airbag mediated touchdown. Pathfinder helped lay the groundwork for the Mars Exploration Rover Mission. That means Spirit and Opportunity. But after Pathfinder, and before Spirit and Opportunity, came a time of failure for Martian landing attempts. Everybody took part in the failure, it seems, with Russia, Japan, the USA, and the European Space Agency all experiencing bitter failure. Rocket failures, engineering errors, and other terminal errors all contributed to the failure. Japan’s Nozomi orbiter ran out of fuel before ever reaching Mars. NASA’s Mars Polar Lander failed its landing attempt. NASA’s Deep Space 2, part of the Polar Lander mission, failed its parachute-less landing and was never heard from. The ESA’s Beagle 2 lander made it to the surface, but two of its solar panels failed to deploy, ending its mission. Russian joined in the failure again, with its Phobos-Grunt mission, which was actually headed for the Martian moon Phobos, to retrieve a sample and send it back to Earth. In one infamous failure, engineers mixed up the use of English units with Metric units, causing NASA’s Mars Climate Orbiter to burn up on entry. These failures show us that failure is not rare. It’s difficult and challenging to get to the surface of Mars. After this period of failure, NASA’s Spirit and Opportunity rovers were both unprecedented successes. They landed on the Martian surface in January 2004. Both exceeded their planned mission length of three months, and Opportunity is still going strong now. So where does that leave us now? NASA is the only one to have successfully landed a rover on Mars and have the rover complete its mission. But the ESA and Russia are determined to get there. The Schiaparelli lander, as part of the ExoMars mission, is primarily a proof of technology mission. In fact, its full name is the Schiaparelli EDM lander, meaning Entry, Descent, and Landing Demonstrator Module. It will have some small science capacity, but is really designed to demonstrate the ability to enter the Martian atmosphere, descend safely, and finally, to land on the surface. In fact, it has no solar panels or other power source, and will only carry enough battery power to survive for 2-8 days. Schiaparelli faces the same challenges as other craft destined for Mars. Once launched successfully, which it was, it had to navigate its way to Mars. That took about 6 months, and since ExoMars is only 15 days away from arrival at Mars, it looks like it has successfully made its way their. But perhaps the trickiest part comes next: atmospheric entry. Schiaparelli is like most Martian craft. It will make a ballistic entry into the Martian atmosphere, and this has to be done right. There is no room for error. The angle of entry is the key here. If the angle is too steep, Schiaparelli may overheat and burn up on entry. On the other hand, if the angle is too shallow, it could hit the atmosphere and bounce right back into space. There’ll be no second chance. The entry and descent sequence is all pre-programmed. It will either work or it won’t. It would take way too long to send any commands to Schiaparelli when it is entering and descending to Mars. If the entry is successful, the landing comes next. The exact landing location is imprecise, because of wind speed, turbulence, and other factors. Like other craft sent to Mars, Schiaparelli’s landing site is defined as an ellipse. The lander will be travelling at over 21,000 km/h when it reaches Mars, and will have only 6 or 7 minutes to descend. At that speed, Schiaparelli will have to withstand extreme heating for 2 or 3 minutes. It’s heat shield will protect it, and will reach temperatures of several thousand degrees Celsius. It will decelerate rapidly, and at about 10km altitude, it will have slowed to approximately 1700 km/h. At that point, a parachute will deploy, which will further slow the craft. After the parachute slows its descent, the heat shield will be jettisoned. Schiaparelli’s Descent and Landing Sequence. Image: ESA/ATG medialab. Click here for larger image. On Earth, a parachute would be enough to slow a descending craft. But with Mars’ less dense atmosphere, rockets are needed for the final descent. An onboard radar will monitor Schiaparelli’s altitude as it approaches the surface, and rockets will fire to slow it to a few meters per second in preparation for landing. In the final moments, the rockets will stop firing, and a short free-fall will signal Schiaparelli’s arrival on Mars. If all goes according to plan, of course. We won’t have much longer to wait. Soon we’ll know if the ESA and Russia will join NASA as the only agencies to successfully land a craft on Mars. Or, if they’ll add to the long list of failed attempts. We all love that feeling of “being there” when it comes to missions to other planets. Juno’s arrival at Jupiter, New Horizons’ flyby of Pluto and the daily upload of raw images from the Mars Curiosity rover makes each of us an armchair explorer of alien landscapes. But there’s always been something missing. Something essential in shaping our environment — sound. NASA recently gave the go-ahead for the Mars 2020 rover that will bristle with a new suite of science instruments including a microphone. Hallelujah! Finally, we’ll get to listen to the sound of the Martian wind, the occasional whirl of dust devils, the crunch of rocks beneath the rover’s wheels and even sharp pops from laser-zapped rocks! The staff and membership of The Planetary Society have been trying for 20 years to get a working microphone to the Red Planet. One flew aboard NASA’s Mars Polar Lander mission in 1998 but that probe crashed landed when its engine shut down prematurely during the descent phase. In 2008 the Society partnered with Malin Space Science Systems to include its next microphone in the descent imager package on the Mars Phoenix lander in 2008. While that mission was successful, the imager (along with its microphone) was turned off for fear it might cause an electrical problem with a critical landing system. Mission planners hoped it might be turned on later but whether it was a money issue or fear of shorting out other critical lander instruments, it never happened. Heartbreaking. One sound souvenir we did get from Phoenix comes to us from the European Space Agency’s Mars which recorded the radio transmissions from the lander as it descended. The signals were then processed into audio within the range of human hearing. Give a listen, there’s a music to it. The Mars 2020 mission, which is expected to launch in the summer of 2020 and land the following February, will search directly for signs of ancient Martian life as well as identify and cache samples and specimens at several locations on the surface for pick-up by later missions. The microphone would be housed with the rover’s SuperCam, a souped-up version of Curiosity’s ChemCam, which fires a laser at rocks and soils from a distance to analyze the resulting vapors for their elemental composition. SuperCam will also shoot a laser to vaporize rocks and spectroscopy to tease out their molecular and mineral composition. The microphone would be mounted on a tube sticking out of the electronics box housing SuperCam and used for scientific purposes but I suspect for public outreach as well. One of its more intriguing uses will be to record the ‘snap’ or ‘pop’ when a rock is struck with the laser. Based on the volume of the sound, scientists can estimate the specimen’s mass. The microphone will also be used to augment studies of Martian weather (the aforementioned winds and dust devils) and listen to the rover’s creaks, groans and whir of its motors as the car-sized machine rolls across the alternately sandy and rocky surface of Mars. The Planetary Society is collaborating with the SuperCam team to make the most of the microphone. Who knows what else we might hear? Exploding fireball overhead? Static electricity? Rhythmic winds? Blowing sand? Slime-slap of alien pseudopods? OK, probably not the last one, but new instruments often reveal completely unexpected phenomena. It’s been hard as hell getting a microphone on a space mission. They’ve had to compete with other instruments considered more essential not to mention the precious space the device would take up and the burden of additional mass. Mission planners consider every fraction of a gram when building a space probe because getting it into Earth orbit and blasting it to a planet takes energy. Rockets only hold so much fuel! You might wonder if Mars’ atmosphere is thick enough to carry sound. The good news is that it is, but unlike Earth’s much denser nitrogen-oxygen mix, Martian air is 100 times thinner and composed of 95% carbon dioxide. If you could snap off your helmet and talk out loud on the Red Planet, your voice would sound deeper and not travel as far. Scientists liken it to having a conversation at 100,000 feet (30,500 meters) above Earth’s surface. Check out the crazy video for a simulation. Now that you’ve made it to the end of this story, sit back and pump up the volume. We’ll have ears on Mars soon! New chemical science findings from NASA’s Mars rover Curiosity indicate that ancient Mars likely had a higher abundance of molecular oxygen in its atmosphere compared to the present day and was thus more hospitable to life forms, if they ever existed. Thus the Red Planet was much more Earth-like and potentially habitable billions of years ago compared to the cold, barren place we see today. Curiosity discovered high levels of manganese oxide minerals in rocks investigated at a location called “Windjana” during the spring of 2014. Manganese-oxide minerals require abundant water and strongly oxidizing conditions to form. “Researchers found high levels of manganese oxides by using a laser-firing instrument on the rover. This hint of more oxygen in Mars’ early atmosphere adds to other Curiosity findings — such as evidence about ancient lakes — revealing how Earth-like our neighboring planet once was,” NASA reported. The newly announced results stem from results obtained from the rovers mast mounted ChemCam or Chemistry and Camera laser firing instrument. ChemCam operates by firing laser pulses and then observes the spectrum of resulting flashes of plasma to assess targets’ chemical makeup. “The only ways on Earth that we know how to make these manganese materials involve atmospheric oxygen or microbes,” said Nina Lanza, a planetary scientist at Los Alamos National Laboratory in New Mexico, in a statement. The discovery is being published in a new paper in the American Geophysical Union’s Geophysical Research Letters. Lanza is the lead author. The manganese oxides were found by ChemCam in mineral veins investigated at “Windjana” and are part of geologic timeline being assembled from Curiosity’s research expedition across of the floor of the Gale Crater landing site. Scientists have been able to link the new finding of a higher oxygen level to a time when groundwater was present inside Gale Crater. “These high manganese materials can’t form without lots of liquid water and strongly oxidizing conditions,” says Lanza. The high-manganese materials were found in mineral-filled cracks in sandstones in the “Kimberley” region of the crater. High concentrations of manganese oxide minerals in Earth’s ancient past correspond to a major shift in our atmosphere’s composition from low to high oxygen atmospheric concentrations. Thus its reasonable to suggest the same thing happened on ancient Mars. As part of the investigation, Curiosity also conducted a drill campaign at Windjana, her 3rd of the mission. How much manganese oxide was detected and what is the meaning? “The Curiosity rover observed high-Mn abundances (>25 wt% MnO) in fracture-filling materials that crosscut sandstones in the Kimberley region of Gale crater, Mars,” according to the AGU paper. NASA’s Curiosity Mars Science Laboratory (MSL) rover successfully bored a brand new hole in Mars at a tantalizing sandstone outcrop in the ‘Lubango’ fracture zone this past weekend on Sol 1320, Apr. 23, and is now carefully analyzing the shaken and sieved drill tailings for clues to Mars watery past atop the Naukluft Plateau. “We have a new drill hole on Mars!” reported Ken Herkenhoff, Research Geologist at the USGS Astrogeology Science Center and an MSL science team member, in a mission update. “Lubango” counts as the 10th drilling campaign since the one ton rover safely touched down on the Red Planet some 44 months ago inside the targeted Gale Crater landing site, following the nailbiting and never before used ‘sky crane’ maneuver. After transferring the cored sample to the CHIMRA instrument for sieving it, a portion of the less than 0.15 mm filtered material was successfully delivered this week to the CheMin miniaturized chemistry lab situated in the rovers belly. CheMin is now analyzing the sample and will return mineralogical data back to scientists on earth for interpretation. The science team selected Lubango as the robots 10th drill target after determining that it was altered sandstone bedrock and had an unusually high silica content based on analyses carried out using the mast mounted ChemCam laser instrument. Indeed the rover had already driven away for further scouting and the team then decided to return to Lubango after examining the ChemCam results. They determined the ChemCam and other data observation were encouraging enough – regarding how best to sample both altered and unaltered Stimson bedrock – to change course and drive backwards. Lubango sits along a fracture in an area that the team dubs the Stimson formation, which is located on the lower slopes of humongous Mount Sharp inside Gale Crater. Since early March, the rover has been traversing along a rugged region dubbed the Naukluft Plateau. “The team decided to drill near this fracture to better understand both the altered and unaltered Stimson bedrock,” noted Herkenhoff. See our photo mosaic above showing the geologically exciting terrain surrounding Curiosity with its outstretched 7-foot-long (2-meter-long) robotic arm after completing the Lubango drill campaign on Sol 1320. The mosaic was created by the imaging team of Ken Kremer and Marco Di Lorenzo. Its again abundantly clear from the images that beneath the rusty veneer of the Red Planet lies a greyish interior preserving the secrets of Mars ancient climate history. The team then commanded Curiosity to dump the unsieved portion of the sample onto the ground and examine the leftover drill tailing residues with the Mastcam, Navcam, MAHLI multispectral characterization cameras and the APXS spectrometer. ChemCam is also being used to fire laser shots in the wall of the drill hole to make additional chemical measurements. To complement the data from Lubango, scientists are now looking around the area for a suitable target of unaltered Stimson bedrock as the 11th drill target. “The color information provided by Mastcam is really helpful in distinguishing altered versus unaltered bedrock,” explained MSL science team member Lauren Edgar, Research Geologist at the USGS Astrogeology Science Center, in a mission update. The ChemCam laser has already shot at the spot dubbed “Oshikati,” a potential target for the next drilling campaign. “On Sunday we will drive to our next drilling location, which is on a nearby patch of normal-looking Stimson sandstone,” wrote Ryan Anderson, planetary scientist at the USGS Astrogeology Science Center and a member of the ChemCam team on MSL in today’s (Apr. 28) mission update. As time permits, the Navcam imager is also being used to search for dust devils. As I reported here, Opportunity recently detected a beautiful looking dust devil on the floor of Endeavour crater on April 1. Dust devil detections by the NASA rovers are relatively rare. Curiosity has been driving to the edge of the Naukluft Plateau to reach the interesting fracture zone seen in orbital data gathered from NASA’s Mars orbiter spacecraft. The rover is almost finished crossing the Naukluft Plateau which is “the most rugged and difficult-to-navigate terrain encountered during the mission’s 44 months on Mars,” says NASA. Prior to climbing onto the Naukluft Plateau the rover spent several weeks investigating sand dunes including the two story tall Namib dune. As of today, Sol 1325, April 28, 2016, Curiosity has driven over 7.9 miles (12.7 kilometers) since its August 2012 landing, and taken over 320,100 amazing images. After many months of painstaking driving, NASA’s Curiosity Mars rover has reached the edge of a massive field of spectacular rippled sand dunes located at the base of Mount Sharp that range up to two stories tall. And she has now begun humanity’s first up-close investigation of currently active sand dunes anywhere beyond Earth. NASA’s Curiosity rover is on the Martian road to soon start the first ever study of currently active sand dunes anywhere beyond Earth. The dunes are located nearby, at the foothills of Mount Sharp, and Curiosity is due to arrive for an up close look in just a few days to start her unique research investigations. The eerily dark dunes, named the “Bagnold Dunes,” skirt the northwestern flank of Mount Sharp. Ascending and diligently exploring the sedimentary layers of Mount Sharp is the primary goal of the mission. “The ‘Bagnold Dunes’ are tantalizingly close,” says Ken Herkenhoff, Research Geologist at the USGS Astrogeology Science Center and an MSL science team member, in a mission update on Wednesday, Nov. 18. The “Bagnold Dunes” have been quite noticeable in numerous striking images taken from Mars orbit, during the vehicles nail biting ‘7 Minutes of Terror’ descent from orbit, as well as in thousands upon thousands of images taken by Curiosity herself as the robot edged ever closer during her over three year long traverse across the floor of the Gale Crater landing site. Curiosity must safely cross the expansive dune field before climbing Mount Sharp. Although multiple NASA rovers, including Curiosity, have studied much smaller Martian sand ripples or drifts, none has ever visited and investigated up close these types of large dunes that range in size as tall as a two story building or more and as wide as a football field or more. Moreover the Martian dunes are shifting even today. “The Bagnold Dunes are active: Images from orbit indicate some of them are migrating as much as about 3 feet (1 meter) per Earth year. No active dunes have been visited anywhere in the solar system besides Earth,” notes NASA. As the rover approaches closer and closer, the dune research campaign is already in progress as she snaps daily high resolution images and gathers measurements of the area’s wind direction and speed. “We’ve planned investigations that will not only tell us about modern dune activity on Mars but will also help us interpret the composition of sandstone layers made from dunes that turned into rock long ago,” said Bethany Ehlmann of the California Institute of Technology and NASA’s Jet Propulsion Laboratory, in Pasadena, California, in a statement. After arriving at the dune, the team will command Curiosity to scoop up samples for analysis by the rover’s pair of miniaturized chemistry instruments inside its belly. It will also scuff the dune with a wheel to examine and compare the surface and interior physical characteristics. Although the huge Bagnold dunes are of great scientific interest, the team will also certainly exercise caution in maneuvering the car sized six wheel robot. Recall that NASA’s smaller golf cart Spirit Mars rover perished a few years back – albeit over 6 years into her 3 month mission – when the robot became unexpectedly mired in a nearly invisible sand ripple from which she was unable to escape. 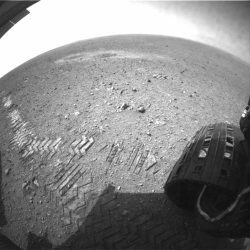 Likewise, sister Opportunity got stuck in a sand ripple earlier in her mission that took the engineering team weeks of painstaking effort to extricate from a spot subsequently named ‘Purgatory’ that resulted in many lessons learned for future operations. Opportunity is still hard at work – currently exploring Marathon Valley – nearly a dozen years into her planned 3 month mission. Based on orbital observations by the CRISM and HiRISE instruments aboard NASA’s Mars Reconnaissance Orbiter, the science team has concluded that the Bagnold Dunes are mobile and also have an uneven distribution of minerals, such as olivine. “If the Bagnold campaign finds that other mineral grains are sorted away from heavier olivine-rich grains by the wind’s effects on dune sands, that could help researchers evaluate to what extent low and high amounts of olivine in some ancient sandstones could be caused by wind-sorting rather than differences in alteration by water,” say researchers. “These dunes have a different texture from dunes on Earth,” said team member Nathan Bridges, of the Johns Hopkins University’s Applied Physics Laboratory, Laurel, Maryland. Last month Curiosity conducted her eighth drill campaign for sample chemical analysis at the ‘Big Sky’ site, before moving on to ‘Greenhorn’. Big Sky was an area of cross-bedded sandstone rock in the Stimson geological unit on the lower slopes of Mount Sharp. As of today, Sol 1168, November 19, 2015, she has driven over 6.9 miles (11.1 kilometers) kilometers and taken over 282,100 amazing images. Dec 8: “America’s Human Path Back to Space and Mars with Orion, Starliner and Dragon.” Amateur Astronomers Assoc of Princeton, AAAP, Princeton University, Ivy Lane, Astrophysics Dept, Princeton, NJ; 7:30 PM.